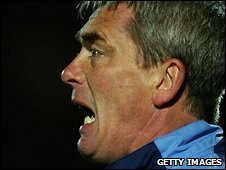 League Two side Aldershot Town have appointed former Reading first team coach Kevin Dillon as their new manager on a deal until 2011. The 49-year-old former Birmingham City, Portsmouth, Newcastle United and Reading player replaces Gary Waddock, who left for Wycombe in October. Dillon left Reading with boss Steve Coppell in the summer and this is his first managerial role. Shots caretaker Jason Dodd left the club on Saturday for Southampton. Dillon told BBC Surrey: "As I've said to a few people, it's not often that you get a chance to come to a club where the team are doing well. "Jason [Dodd] has come in and has stabilised things, they've come through the end of that and hopefully I can take it on and improve things." Acting Shots chairman John Leppard is hopeful Dillon will prove to be the latest of what has been a series of good Shots managers. "It's the fourth time I've been on the interview panel, so we've just stuck to the same way and it's been good in the past so hopefully we'll continue that trend," he said. Is Kevin Dillon a good appointment for the Shots? "He came with a full agenda, it was like he was giving us the interview as much as we were giving him an interview which doesn't happen very often, not in our case anyway. "He knew exactly what he wanted, where he wanted to go, what he needed to do and he was just very very impressive."